Welcome to the Solar O&M Insider, the first podcast series dedicated to solar PV operations, maintenance and asset management. This series is brought to you by Alectris, a global solar asset care innovation firm. Glenna Wiseman of Identity3 is the host. This is the third episode of our special series on the Global Solar Energy Standardisation Initiative or SESI by IRENA and The Terrawatt Initiative with the support of SolarPower Europe and the Global Solar Council. December 7 the work of these organizations, along two parallel tracks, comes together at the O&M and Asset Management Conference in London. Welcome, everyone, to this third episode of this special series on the “Global Solar Energy Standardisation Initiative” put together on the global stage by IRENA and The Terrawatt Initiative with the support of SolarPower Europe and the Global Solar Council. We have an event coming up here in December on the 7th, the O&M and Asset Management Conference. There are parallel tracks, if you will, here between the SESI Initiative and the SolarPower Europe O&M Guidelines. The O&M Guidelines is moving into its second iteration. Can we start with some perspective on the O&M Guidelines and how they differ and/or contribute to the SESI Initiative? Bruce, you could answer that for us and then followed by Vassilis? Bruce: The O&M Guidelines came out of a workstream within SolarPower Europe and SolarPower Europe represents companies active in the solar space across the value chain. One of our workstreams is on operations and maintenance. Within that workstream, it’s clear that within Europe, until this year, we didn’t have best practice guidelines on how O&M should be done on solar plants. There’s some work being done in the U.S. but nothing in Europe. So, within the workstream, we put together a set of best practice guidelines which were launched at the end of last year, 2016. We are in the process of updating those guidelines, and within the context of the guidelines, the contracts were clearly an important part, but just one part of it. The guidelines cover everything from health and safety, power plant operations, management systems, data, spare parts, and so on. But what was clear was the contracts were an important part of that, between the project owners, the asset manager, and the O&M supplier. Now, at the same time, the Terrawatt Initiative and IRENA were developing, with a number of the leading legal firms around the world, the Standardisation Initiative. And part of that was an idea to have a standard contract for O&M. It fitted perfectly with the work we were doing. It’s avoiding the overlap. We’ve been working very closely with them and with the Terrawatt Initiative leading this process, we’ve been providing feedback and input from an industry perspective, so players such as Alectris are providing leadership and input to the guidelines, but also specifically to what we see as a vital tool in the process of streamlining and reducing the cost of solar is this tool, the O&M contract, the standard contracts for O&M. Vassilis: The best practices–just to answer the question, Glenna, what is the difference between the best practices document and the contract template–the best practices are not a legal document. It’s not a contract with all these legal clauses and definitions about force majeure events and similar. The initiative started, as Bruce said, when it was clear there was a huge gap in the European solar industry. Although being the first mover, the pioneers in the solar space in Europe, we just missed, you know, evolving in my eyes. We saw markets which started much later than Europe evolving in this direction much faster, like U.S., for example, where they have been developing quite a series, a very long list of best practices in similar documents. I think SolarPower Europe picked up very correctly and identified a need in the market and started these initiatives almost two years ago. The purpose there was to prescribe out of the experience gained throughout the years in Europe what should the best practices be for providing O&M services. Now, I think one of the major differences from what we’ve seen in other regions is that these documents did include a broad range of activities. Although we were seeing similar documents focusing on maintenance and, on-site work, we decided from the very beginning to include both the operations and maintenance of the work set. So, I would say that even from the beginning with the major differentiation factors, we’re not just focusing on the technical field work but also discussing anything that has to do with the operations. Going or being very close in releasing the second version, there has been some substantial changes which are going to be announced in December in London. Apart from fine-tuning the existing document and collecting all the feedback throughout the last months, we have worked a lot on the health and safety, which is a sensitive subject by itself. We have included a section for technical asset management, and the reason we did that is because, in some regions, O&M is understood as technical asset management and on some others as just maintenance. We did one to cover both maintenance operations and technical asset management in one single document. We’ve worked quite a lot on the definitions of KPIs. As Bruce said, we came across this opportunity, if I can call it that, with the standard contract with SESI. So, we have to align the best practices document and the KPIs and various other points in the document with the standard document that is currently under development. There’s been some re-arrangement. We added an additional section about contractual guidelines. Of course, as I mentioned, the purpose of the document is not to go into the legal details but give the framework of providing operation and maintenance services and key points for O&M contracts, which are in this case completely aligned with the O&M standard contract that we are working together in the workstream of SESI. Glenna: The event in London describes standardisation as an opportunity to facilitate higher standards and lower costs, those two pillars in the solar PV industry. Sophie, your organization is hosting the event. Tell us about how your organization is involved in this event and how do you, as an attorney working with this and working with the SESI O&M workstream to do the contract template for O&M, how do you see increasing standards and lowering cost? Sophie: We are indeed delighted to contribute to this. Bird & Bird has a very special dedicated energy utilities practice. Over the past years, we’ve also worked on one-third of the solar transactions on project development that has taken place in Europe. That provides us with good insights into the market but also provides us with a good insight to the contracts that have been entered into. The way we can higher the standard is just based on, as it’s been discussed already, we take the existing expertise that is there with all the related market parties and we combine that with the simplified contracts, who already deal with an appropriate balance of risk and whereby the most appropriate party is attributed with the relevant risk. Rather than that parties that are going into project development are still trying to reinvent the positions of each party and trying to reinvent the balance between contracts. Parties can trust that the standardized agreement has taken on board all of the experience of the past years and have created that balance already that enables the parties to feel comfortable with the standard set of documents. It should also create a certain trust in the set of documents. The parties are feeling comfortable with a set of documents and with the balance of risk and that they’re not feeling that they should try to reinvent the wheel or they should try to re-negotiate and shop around positions. Glenna: This theme of increasing standards or performance and lowering cost, Jean-Pascal, there are three core pillars in the SESI Initiative that Terrawatt and IRENA have created, which is simplification, balance risk, and innovation. How do you see those pillars applying to the two aspects that this event in December is addressing? Jean-Pascal: There are so many ways that it’s very difficult to give them all. Basically, what we all aim at is really to make the choice of solar a rational, economic decision. Each and every piece that can be put into the battle in order to make solar more competitive than any other fossil fuel so there’s no question about choosing solar or choosing renewables generally speaking as the source of power for the 25, 30, or 40 next years must be used. That means that it’s a multiple approach. It’s a risk approach. It’s amortization of inflation. It’s standardisation of contracts. It’s also in innovation. We didn’t talk on this podcast about the impact of digitalization on what we are doing and how intelligence can bring the renewables, and solar in particular, at its next level of integration into the system for the benefit and the service of the communities and the people. How it relates to this December event is only the fact that what is at stake here is really about how to make this cost go down. The previous question was about the quality and the higher the standard. The quality standard, this is one way to also reduce the cost. And that’s the financial trick of it, is especially in developing and emerging countries because of the importance of the cost of capital. Cost of capital is the most important element of cost in the solar cost of electricity. That’s something people tend to forget, especially in Europe because, for a long time, there was this question of the cost of equipment that was completely in front of the eyes of everyone. But everyone was forgetting about the cost of capital, especially in Europe because here the cost of capital was not that high. But in most of the emerging countries and developing countries, it’s more than 70% of the cost of electricity comes from cost of capital. One of the reasons of this high cost of capital is the risk. And the risk perception from the industry, from the finances which can be dealt partly with by the industry. The higher standards and the higher quality standards, in particular, are providing more confidence of the financiers in the capacity of the assets providing the cash flows that are necessary to pay back the financing. Consequently, it means that they are ready to give up a little part of the risk premium that they usually take. And on capital intensive equipment like solar, it makes a huge difference. The question is how I would make higher standards with lower costs. And that’s exactly what Sophie mentioned is just because we are standardizing it and making it embedded in every deal as a natural part of having it with the put on top of the deal. Glenna: Bruce, I want to make sure that I understand. We’ve got the SolarPower Europe O&M guidelines, which is really kind of a manual, a set of definitions and best practices and really, you can operationalize, you can streamline your organization by using these guidelines. Then we have the Global SESI Initiative, the set of seven contracts which will basically streamline the whole legal aspect of solar development and operation. First of all, do I have that right? And then second, how did those two things come together at the December event and what can attendees expect in terms of inputs there? Bruce: I think you summarized it quite well. The best part of the guidelines, if you like, it’s a manual, a sort of instruction manual. As Vassilis rightly pointed out, it’s not a legal document. It’s best practice guidelines, exactly as it says. The SESI Initiative and the contracts that come out are, if you like, a toolkit that can be used by the industry as part of the best practice guidelines. So, you know, when they’re doing deals, when they’re negotiating, they can use those contracts to facilitate and speed up the process and lower the cost. The event pulls that all together. There’s no point of having these guidelines and contracts without them being used. I think the main objective of the event is to raise awareness about these documents, highlight the advantages of them, and encourage the industry, the wider industry, to use them. We will be doing quite a significant launch at that event on the 7th of December in London of the new updated best practice guidelines, version 2.0, which Vassilis and Alectris have been leading on as part of the SolarPower Europe O&M task force. But also, we’ll be launching and announcing the O&M contract part of the set of the standardisation initiatives. And then shortly after the Christmas break, in January, the contracts will then become available. Once they’ve been presented and approved at the IRENA General Assembly in Abu Dhabi in January, the contracts will then be made available. Our role as the solar association in Europe but also representing the global industry is to promote and disseminate these guidelines and the contracts to the industry and encourage them to use them. Jean-Pascal: Keep in mind that the standardized contracts are one of the best practices that is somewhat in the guidelines, for one. On the other side is the contracts themselves say when you are an O&M provider, for example, what you need to provide. Then the question is how you will provide it and what standard quality you will provide it? Having guidelines like the one that has been developed by the SolarPower Europe is something which is really crucial for the parties to the contract, especially for the one which is not the O&M provider but the professional. In a lot of cases, it’s the asset owner and the banker that we are talking about. It’s just to have something to which they can refer and ask being the way that the expected behavior of an O&M provider in the performance of the contract. That’s helpful, so very much the industry and the O&M providers to raise the level of quality of what they are doing. Also to gain trust that these players can inspire to the asset owner and the banker, the lender. Glenna: Thank you, Jean-Pascal. Vassilis, just briefly, what can folks in the industry expect from Guidelines 2.0? Vassilis: We have already integrated a lot of substantive changes. For example, health and safety, we worked quite a lot on that. We did include a section for technical asset management. We reworked a bit the KPIs. I think the most important probably is an addition included a section about contractual guidelines. This section is actually in complete alignment with the standard contract we’ve been working with the rest of the workstreams in the SESI initiative. As actually has been pointed out by all of you and I have never thought about them to be used, I think the best practices now work so nicely together with the standard O&M contract, you can look at that as an instruction material basically. You have the standard contract, the O&M contracts–so from the legal perspective, fitting together with all the rest of the SESI Initiative–and the best practices is the instruction manual on how actually to provide the services in the best way, what to expect from your O&M providers, and how exactly in detail should the services be provided down to the last day. We’ve spent a lot of time elaborating on the technical stuff, like how monitoring should be done. There is a lot of work we have added in the last year. I’m glad also to say we have a lot more, let’s say, involvement from SolarPower Europe’s members and much more contribution, which I think the value of the document comes from the members of the task force. The more members we have, the more value and more experience we can integrate into the document. I would not actually see that as an isolated document or as an isolated initiative. Now, together with the standards O&M contracts from SESI, I’ve seen these two documents, they work together. The instruction manual and the actual legal framework to conduct the services. The last, of course, as I mentioned, has a lot of new additions, more details about specific subjects and some sort of rearrangement of the chapters to make that easier to understand and more clear and simpler. Jean-Pascal: If I may add to that, first of all, I would like to congratulate Vassilis and the team for this huge work of putting together this version 2.0 of the guidelines and invite maybe Bruce to think about having a guideline laid back for all of the standardized contracts, for each of the standardized contracts, so that the industry goes more into the operation details of what the contracts are providing. Bruce: Absolutely, Jean-Pascal. That’s a great idea and certainly, it’s something we would take forward both at a European level and an international level. As you know, there is a mirror to what’s happening in Europe. At the international level, we’re working with yourself at the Terrawatt Initiative and with IRENA, within the Coalition for Action. Bruce: Developing there a similar model, if you like, an instruction manual. We call it a white paper. It’s more appropriate for decision-makers, I think, to consume white papers easier than the best practice guidelines. But it’s a similar content, which is basically how to remove the barriers. We’re providing solutions and policy recommendations to scaling up renewables in emerging markets. That is the instruction manual. Alongside that, it’s the toolkit, of which SESI is one vital part of that toolkit. We can do this in Europe, we can do this internationally. We should roll that out across the other contracts as they become available in January, that there’s an instruction manual, best practice guidelines, if you like, that goes along with them. I think that’s an excellent idea. Glenna: It sounds like that’s job security for everybody on this call, because that’s a whole lot of work we just talked about. I have a practical question for Sophie and then a question about dissemination for Jean-Pascal. Sophie, as an attorney, you have a unique point of view. All of these organizations that we’re trying to reach with these standardisation initiatives have attorneys. How, from your point of view, what would you say to these other attorneys in terms of using these template documents? Sophie: All these market parties have their own attorneys, also their own in-house counsel. What I would say is embrace these set of documents, trust the people who have been doing this for years and years, help yourself by lowering the cost of your own project development, and spend the time wisely by focusing on innovation rather than spending costs on agreements that had already been entered into for many times, and trust the voice of the market, of the suite of contracts. Glenna: Excellent. Jean-Pascal, how will the industry be able to access the approved documents in January? They will be approved at IRENA, and then what happens? How do the documents get out into the market? Jean-Pascal: Maybe before answering your question, a little comment on what Sophie just said. I’ve been an attorney and also an in-house counsel for many years. And I fully agree. At some point, doing these contracts over and over again becomes really boring. We think that when you are doing that you are probably spend your time more wisely doing innovation and thinking about how opportunities will happen rather than copy paste and you spend nights doing something which is really getting boring. So, the standardisation, you can have the feeling that this will take away somewhere from the law firms. But from what I know and what I’ve lived honestly is the most interesting part of the business that you are not taking away from that. About the dissemination of it, it’s really a matter of the market. It’s not the approval of the guidelines by IRENA that makes it a law. It gives a stamp, which is a very important one because then you can say in your advocacy that the governments are happy with that and no one will complain about it. But it’s really a matter of having the private sector party use it. There’s several ways of dissemination. First of all, they are open source. They will be freely accessible to everyone on the website of IRENA, as well as Terawatt. Anyone and any other partners of these initiatives if they want. Then starts a long advocacy process towards people that can promote and be prescribers of these contracts, like the lenders. We have a very strong network of lenders in the community, in the lenders community, to promote that. There is also an advocacy towards the industry. And I think that’s what Bruce and SolarPower Europe and the Global Solar Council are currently doing is really great. There is also this very specific instrument that we are currently developing and hope that we’ll be able to put together next year, which is known as the CRMM, the Common Risk Mitigation Mechanism (CRMM). And if you allow me to make a little digression on that. The international alliance and the 17 countries that are interested task force, Terrawatt is member of it, in last May to help them to design a risk mitigation mechanism or credit enhancer, otherwise said, to limit or to manage or to transfer the risk that are not manageable by the markets, by the developers, mainly the contraries, the offtakers risk, and the currency-related risk, which are the FOREX and the transfer and convertibility to a specific international entity in order to give these projects in the developing and emerging countries where alliance is active, the International Co Alliance. We are also working right now on this study that we will release publicly during COP23 also. One of the outcomes of that is the risk definition mechanism can only work properly if they do this, if the parties are using the standardized documentation. Being understood that in order to be able assess the risks of projects easily and cost-effectively, you really need to have a solid base risk allocation use, which is reflected in the standardisation suite of SESI. If people were to benefit from this de-risking instrument, they’d probably will need to use the standardisation instrument in entering contracts. That’s one of the very powerful ways to disseminate this contract because they would be necessary for something which actually opens the market. Glenna: Excellent. We will have links to the documentation that you can download once it’s available and for the documentation that is available now. When I think of all the amazing work you and all the many companies and professionals and climate leaders and solar leaders that are involved with this, it seems that we are taking out the friction in the market and opening it up for innovation, which the planet desperately needs. I congratulate all of you and I thank you all for the work that you’re doing and for joining us on this series for the Solar O&M Insider. Jean-Pascal: Thank you very much. Bruce: Thank you very much. 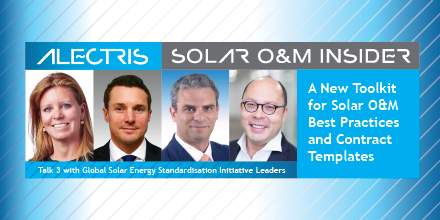 Thank you, listeners, for joining us for this special episode of the Solar O&M Insider, dedicated to the O&M standardisation efforts by SolarPower Europe and the Global Solar Energy Standardisation Initiative. I’m Glenna Wiseman of Identity3. The Solar O&M Inside podcast series is brought to you by Alectris, at alectris.com.